Cysticercosis is a parasitic disease commonly found in underdeveloped areas including Mexico, Central America, China, Korea, Indiaand parts of Eastern Europe. While previously uncommon in the industrialized countries, this parasitic infestation is becoming more prevalent in the United States as a result of the recent influx of immigrants. When cysticercosis affects the brain or spinal cord, the condition is called neurocysticercosis. Usually, the cyst causes inflammation in the brain tissue itself which results in a seizure. In about 10% of neurocysticercosis cases, the cysts are found within the cerebral ventricles or in the cerebrospinal fluid spaces (cisterns). This can cause hydrocephalus or symptoms due to pressure on the brain. In about 10 percent of neurocysticercosis cases the cysts are found within the cerebral ventricles or in the cerebrospinal fluid spaces (cisterns). This can cause hydrocephalus or symptoms due to pressure on the brain. The most common symptoms are related to hydrocephalus. The onset of symptoms, including headache, vomiting, seizures, can be rather sudden and can result in death. A degenerating cyst can cause symptoms of meningitis. Cisternal cysts can act like brain tumors, causing symptoms due to compression of the brain. The symptoms will depend upon which part of the brain is affected. 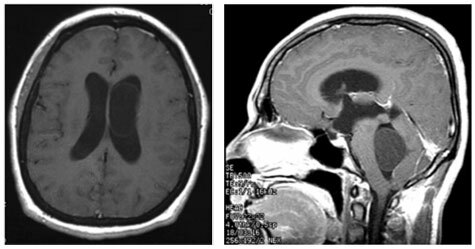 Diagnosis is best made by magnetic response imaging (MRI), although intraventricular cysts can sometimes be very difficult to detect on routine MRI imaging. Neuroendoscopic removal of the cyst. UCLA neurosurgeons have extensive experience with this technique. Treatment with antihelminthic medications, usually is limited to small asymptomatic cysts. This option is usually limited to small, asymptomatic cysts.